The venerable Sims franchise might seem like it was tailor-made for smartphones, but surprisingly a full version of the popular game has never made it to mobile. While Electronic Arts released the simplified and in-app purchase-heavy Sims FreePlay back in 2011, it seemed like the dream of a real-deal mobile port of the PC game was all but over. Fans of the simulation series will be happy to learn that a mobile version isn’t just in the works, it’s just around the corner. As its name suggests, The Sims Mobile appears to be a touchscreen version of The Sims 4 Legacy Challenge, which was released for Windows and macOS (then OS X) in 2014. Of note, it also teases a multi-player party mode, though EA hasn’t specified how many of the PC features and neighborhoods will be available at launch. While the game will be free to play, it will almost surely follow the in-app purchase model established by The Sims FreePlay. This PC version of the Legacy Challenge varies from the full Sims 4 in that users only have control over a single Sim, and a set of self-imposed rules limit what you can do. Players start the game with a single young adult Sim and control their path through building their home, career, and family. 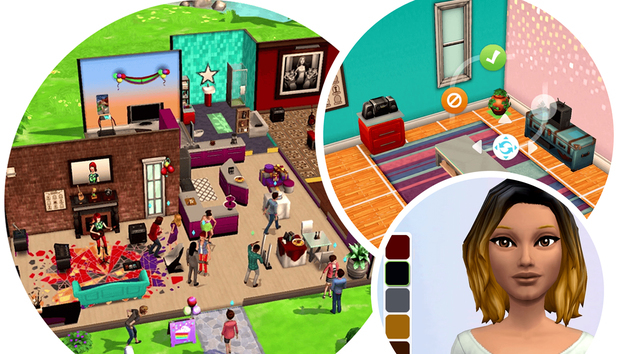 Game on: With the exception of maybe Mario and Minecraft, few games generate the kind of excitement that The Sims does. Even in its 16th year, the PC game still has millions of die-hard fans around the world, and The Sims Mobile is sure to rival Super Mario Run and Pokemon Go for popularity.